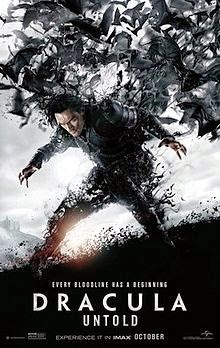 Dracula Untold is an upcoming 2014 Irish-American dark fantasy action horror film directed by Gary Shore and written by Matt Sazama and Burk Sharpless. Based on the novel Dracula by Irish novelist Bram Stoker, the film portrays the origin story of its title character, Count Dracula. Principal photography of the film began on August 5, 2013 in Northern Ireland. Universal Pictures will release the film on October 10, 2014 in theatres and IMAX. Universal intends the film to be a reboot of the Universal Monsters franchises.